Magnesium helps to relax both the body and the mind. We need Magnesium to help send messages throughout our nervous system. It is also used to calm the nervous system, which can be doubly important in children suffering from hyperactivity disorders. 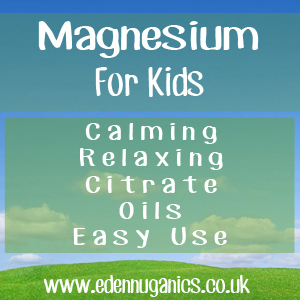 Sufficient levels of Magnesium enable children to think clearer and concentrate better. Magnesium is also required by the body to produce Serotonin, an important neurotransmitter that helps to provide a feeling of calm and relaxation. Low levels of Serotonin are associated with irritability, moodiness and depression in children. Magnesium is essential for the relaxation of muscle fibres. Without this dietary mineral, spasms and twitches are a common problem. One of the most common of these is leg cramps, sometimes referred to as 'Charley horse'. Magnesium helps muscles in the body to relax and function properly. When the body feels calm, it is easier for hyperactive children to behave calmly. Supplementation of Magnesium is safe in children, however the dosage is very important. Children aged one to three should take no more than 65mg per day. 110mg per day for children aged four to eight and 350mg per day for children older than eight years of age. Magnesium Citrate is an easily absorbable form of Magnesium that's great for kids. You can find a powdered drink mix called Kids Calm at most health food stores. To make this simply add water for a fizzy drink sweetened with organic Stevia that has the opposite effect of most sugar filled carbonated drinks on the market. For kids, the dosage begins at 1 tsp twice per day. Magnesium oil is not really an oil at all, it is simply Magnesium chloride flakes dissolved in distilled water. However, when applied to the skin, it does have an oil like feel. Magnesium oil is by far the best way to supplement Magnesium for children. Simply apply the oil with a spray bottle. Put a little in your hand and warm the oil before applying to your child's arms and legs. It will be absorbed through the skin via a transdermal action. Can my child get too much Magnesium? Receiving too much Magnesium from diet alone is very unlikely. However, it is possible to overload on Magnesium in dietary supplements. Taking too much Magnesium can cause problems like diarrhoea and stomach cramps. In very large doses, Magnesium can be toxic.